WhatsApp is most probably the most successful smartphone App used for communicating. As you know WhatsApp shuffles so many data daily that your smartphone consumes the considerably large amount of space for videos, images, chats and so on. Some smartphones have less internal space or with no SD cards installed and hence using cloud storage becomes necessary option. 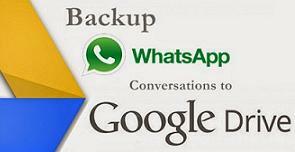 WhatsApp has recently added support for Google Drive which is a very welcome news. Now you don't need to worry about losing your WhatsApp data on your smartphone. Instead, just let them be saved automatically on cloud storage such as Google Drive at regular interval. Best settings are to keep the backup on over Wi-Fi only or over Wi-Fi and Cellular. This way you will free up your smartphone storage and stay assured for your valuable data.